Alister Henskens Member for Ku-ring-gai, Superintendent Jenny Scholz, Jonathan O’Dea Member for Davidson, Minister for the Prevention of Domestic Violence and Sexual Assault Pru Goward, Josie Gregory Women’s Domestic Violence Court Advocacy Service, Janet Henegan Manager Naremburn Family Centre. People experiencing domestic and family violence will receive tailored, multi-agency support with the roll out of Safer Pathway in the Northern Beaches and Ku-ring-gai Police Local Area Commands (LACs) from March 2017. 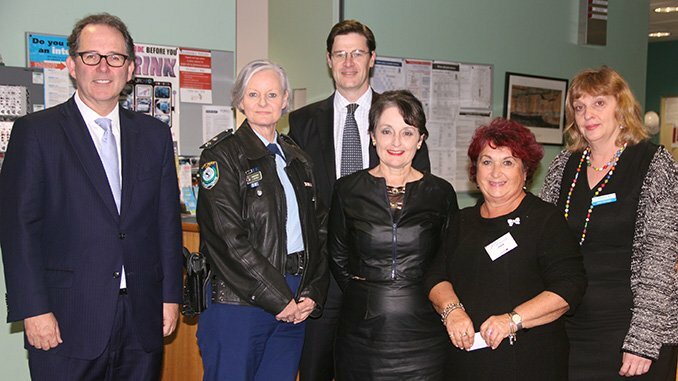 Minister for the Prevention of Domestic Violence and Sexual Assault Pru Goward was joined today by the Member for Ku-ring-gai Alister Henskens and Member for Davidson Jonathan O’Dea at the Gordon Police station to make the announcement. Ms Goward said Safer Pathway aims to ensure every domestic violence victim across NSW receives a consistent and effective response regardless of where they live. Safer Pathway brings together local representatives including Police, Health, Corrections, Family and Community Services and Education along with local specialist non-government domestic and family violence services, creating a streamlined, integrated referral pathway for victims who are ‘at threat’ or ‘at serious threat’ to their life, health or safety. The service will be coordinated by the Northern Sydney Women’s Domestic Violence Court Advocacy Service, which has a long history of providing professional advocacy and support for women who have experienced domestic violence. “Courageous victims who have been left traumatised and terrified will no longer have to shop around to get the services they need nor will they have to re-tell their story to a multitude of government agencies,” Ms Goward said. Deputy Premier and Minister for Police and Justice Troy Grant said the NSW Liberals & Nationals Government is committed to breaking the cycle of domestic violence in NSW. “This roll out means even more victims across NSW will now receive coordinated help and support to live their lives free from violence,” Mr Grant said. Member for Ku-ring-gai Alister Henskens welcomed the announcement that the Ku-ring-gai and Northern Beaches LACs would be among the first LACs for the Safer Pathway expansion. “Domestic violence is a scourge. We know that having the right support for in place for victims is vital. That is why I am so pleased Safer Pathway will be rolled out to assist victims recover from abusive relationships,” Mr Henskens said. Mr O’Dea said Safer Pathway makes it easier for people escaping domestic violence to get the help they need when they need it most. “Domestic violence is a crime and has no place in our community. The expansion of Safer Pathway into our area means that domestic violence survivors will receive tailored, holistic support for things such as safety planning, health and wellbeing and housing,” Mr O’Dea said.